One of my favorite summer time snacks is this simple Taco dip that we made every summer when I was growing up. Simply mix the taco seasoning and the sour cream together then spread evenly along the bottom of a serving dish then add lettuce, tomatoes, and cheese. Serve with your favorite style tortilla chip. Love a good taco dip! Perfect for summer parties outdoors! This is quick and easy. I will be using my homemade taco seasoning I keep on hand instead of the package stuff. Sounds and looks so good, I will have to try this recipe out. Thanks for sharing! Looks sooooo yummy! I’m a sucker for any kind of taco dip. I haven’t made a dip in so long – I really need to make this – looks delish! I wish this was my lunch today! Yum! I love a good taco dip! And I love an even easier app! Thanks for sharing! Taco dip. Yes. Anytime. YUM! I am a huge fan of Tex-Mex. Anything that I can make at home and it’s quick and easy, gets a thumbs up from me. I love tacos! Taco dip sounds really delicious. I can’t wait to try this. This looks quick and easy and sounds good. 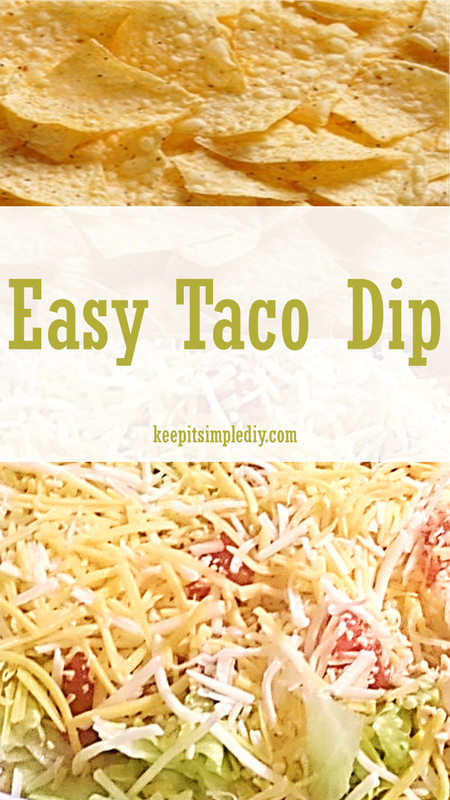 I make a dip very similar to this for family get togethers and it is always a big hit!